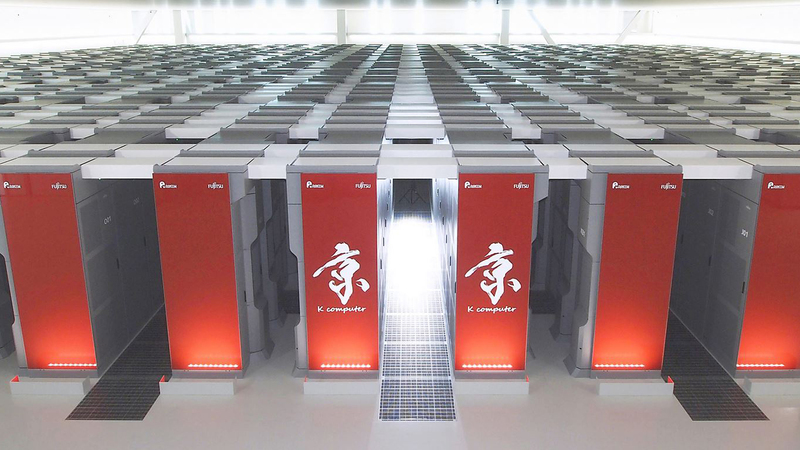 Fujitsu on December 01, 2016, announced the completion of the Oakforest-PACS supercomputer at the Joint Center for Advanced High Performance Computing (JCAHPC), which is jointly run by the University of Tokyo and the University of Tsukuba, and that operations have commenced. This new supercomputer is comprised of FUJITSU Server PRIMERGY CX600 M1 x86 servers. It uses Intel Xeon Phi processors in its 8,208 computation nodes, achieving a total theoretical computational performance of 25 petaflops(1). Using performance tuning technologies from Fujitsu and Fujitsu Laboratories Ltd. aimed at large-scale, high performance computing to draw out the maximum system performance, the system achieved 13.55 petaflops on the LINPACK(2) benchmark used to show supercomputer performance on the TOP500 rankings, placing it first in Japan and sixth in the world. 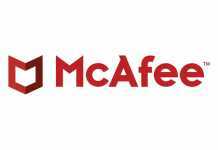 It also achieved 385.5 teraflops(3) on the HPCG (High Performance Conjugate Gradient) benchmark(4), which is known to be a performance indicator closer to actual application performance, placing it third in the world. Fujitsu will be supporting Oakforest-PACS, which will contribute to the development of science and technology across all of Japan on the basis of Japan’s first joint operation by two universities. 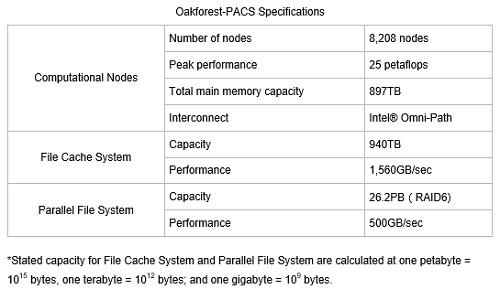 Under the operation of JCAHPC, Oakforest-PACS will not only promote research and development in a variety of next-generation science and technology fields, but will also contribute to human resource development in the computational science and high performance computing fields, which will play key roles in the future. Fujitsu is involved in the two universities’ activities, providing total support for various research, development, and analysis operations, through its broad product lineup, strong service structure, and experience accumulated over 40 years of high performance computing. Fujitsu will continue to work on developing the world’s top-level supercomputers, providing even faster and higher performance systems. Short for peta floating point operations per second. Peta is an SI prefix indicating one quadrillion, or 1015, so this indicates one quadrillion floating point operations per second. A program developed by J. Dongarra, Ph.D., of the University of Tennessee, for solving a system of linear equations using matrix computation. It is the benchmark program used to create the TOP500 list, which ranks the performance of the world’s supercomputers. Short for tera floating point operations per second. Tera is an SI prefix indicating one billion, or 1012, so this indicates one billion floating point operations per second. An international ranking of processing speed with the conjugate gradient method used in industry and other actual applications.